For some constitutional lawyers, the proposition that the Queen will withhold Royal Assent from the European Union (Withdrawal) (Number 5) Bill is ludicrous: it would be inconceivable, they aver, for Her Majesty to block the express will of Parliament. Indeed, it would, they further aver, lead to a constitutional crisis the likes of which we have not seen since… well, some say 1936, others 1708, and still others 1649. Whichever comparison is preferred, the current situation is neither without precedent nor commensurable constitutional concern. Yet other lawyers take the view that the Queen must only act on the advice of her ministers, which is the convention, and that her neutrality is preserved by doing so. And since the Crown’s ministers oppose this Bill – it being in blatant contravention of their manifesto pledge to the people – the truly non-partisan action for her to take would be to withhold Royal Assent, for to grant it would run counter to the majority who voted to leave the EU (in both the 2016 Referendum and the 2017 General Election), and so be “out of gear with the nation’s interests”. Ergo withholding Royal Assent would be conducive to the common good and to sustaining the Queen’s Peace. The inclination toward or from either argument is largely determined by whether one wishes to leave the EU or remain in it. Either way, even if there may be a strictly legal formulation of neutrality for the Crown-in-Parliament to follow in the granting of assent, the perception of the Queen’s personal neutrality will be marred. If the European Union (Withdrawal) (Number 5) Bill is passed against the will of the Crown’s ministers, the Queen is eschewing the advice of the Government she has appointed and siding with Parliament against her ministers. Indeed, no responsible minister will have countersigned the warrant affixed to the Great Seal, and so the Queen would not be acting neutrally because Parliament (Commons and Lords) is not responsible or subject to democratic control. For the Crown to sustain its strict political neutrality, it should neither assent to nor refuse this Bill, for to do either would be to become embroiled in the ongoing contentious debates around conflicting perceptions of the good of a ‘no deal’ Brexit. And yet, constitutionally, the Queen has to be embroiled because, although she may be non-partisan and non-aligned, she is not aloof, disinterested or unengaged: every Bill which is placed before her is an expression of social, spiritual or philosophical value, and by assenting or refusing assent she affixes or denies her Seal to political objectives which are not value-free. 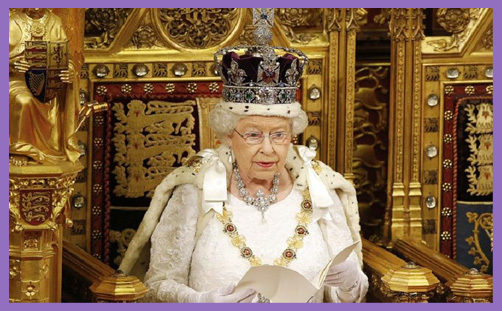 Which brings us to a dimension of Royal Assent which the constitutional lawyers are not considering, and that is the Queen’s role as Supreme Governor of the Church of England. The fact that the Head of State is also Supreme Governor of the Established Church means that she is obliged to exercise her public ‘outward government’ in a manner which accords with the private welfare of her subjects – of whatever creed, ethnicity, sexuality or political philosophy, including whether they are Leavers or Remainers. The Royal Supremacy in regard to the Church of England is, in its essence, the right of the Crown in the supervision of its administration in order that the religious welfare of its subjects may be provided for. While theologians and politicians may argue over the manner of this religious welfare, the point is that no Bill placed before the Queen should cause her to break her solemn Coronation Oath to “govern the Peoples of the United Kingdom of Great Britain and Northern Ireland… according to their respective laws and customs”; and “to the utmost of [her] power maintain in the United Kingdom the Protestant Reformed Religion established by law… and preserve inviolably the settlement of the Church of England, and the doctrine, worship, discipline, and government thereof, as by law established in England”. It has long been observed that the laws and customs of the secular European Union are increasingly antithetical to the laws and customs of the United Kingdom, which is a polity founded upon the precepts of Christianity. The latter has, incrementally over centuries, bequeathed to us a settlement of liberty, justice and peace. The former has, over just a few decades, imposed upon us an authoritarian and illiberal conception of rights which are impinging upon religious freedom, imperilling common-law notions of justice and endangering peace. What is Royal Assent for if it may not be withheld when the Monarch deems a bill to transgress our shared self-understanding and respect for our institutions of justice and liberty? What is Royal Assent for if it is not to veto a profoundly flawed, ill-considered and procedurally irregular piece of legislation which pitches Parliament against the people? What is Royal Assent for if it is not to sustain the gospel ethic of peace and reconciliation over societal division and civil strife? Constitutionally, the Queen has the power to advise and warn her ministers. But when her ministers are not presenting the European Union (Withdrawal) (Number 5) Bill for Royal Assent, how does she advise and warn Parliament that their conception of the good is at variance with that of the responsible Government, which is her appointed Government? How does she remind them that their political objective runs counter to the express will of the people, which was to leave the European Union, and that her appointed Government promised to deliver whatever the people decided? How does she point out that by either granting or withholding her assent from this Bill, the neutrality of the Crown in the eyes of her subjects is severely compromised, if not completely negated?